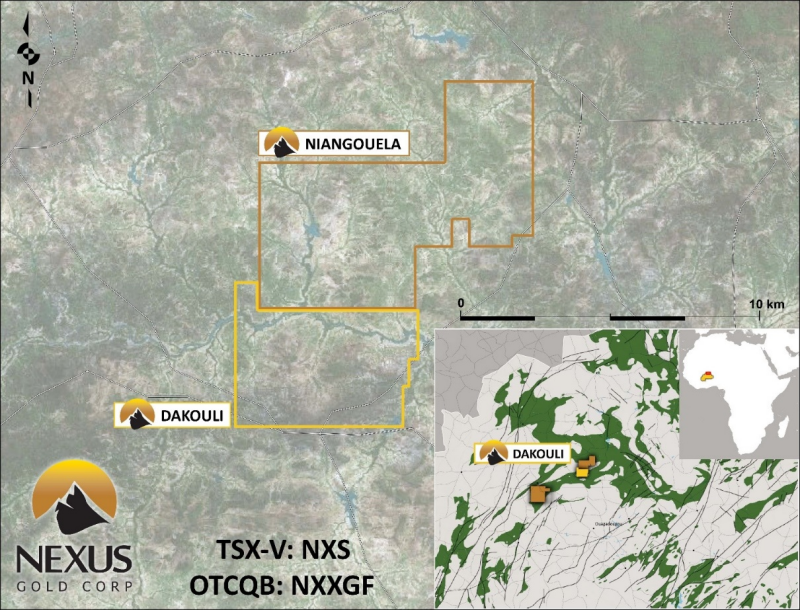 Vancouver, Canada / TheNewswire / March 20, 2019 - Nexus Gold Corp. ("Nexus" or the "Company") (TSX-V: NXS, OTCQB: NXXGF, FSE: N6E) is pleased to report geochemical results from recent exploration activity at the 100% -owned, 98-sq km Dakouli 2 Gold Project, located on the Goren Greenstone Belt, central Burkina Faso, West Africa. The Company recently completed a termite mound sampling program that tested 100 targets extending some 2500 meters west, and 350 meters south, from the northeastern boundary of the Dakouli 2 exploration permit. The survey was designed to follow up on high-grade rock samples reported earlier this year (see Company news releases dated January 8 and January 14, 2019). These samples (see Table 1) were collected from surface workings ("Orpaillages") and at depth, located at the northeast corner of the Dakouli property and the southeast corner of the Company's adjacent Niangouela exploration permit. The termite geochemical data obtained from the survey has outlined an anomalous zone extending some 500 meters west from the current workings. Based on these results the Company is now initiating a 190-line kilometer soil geochemical survey covering the northern half of the Dakouli 2 property and southern portions of the contiguous Niangouela property. This survey will generate important geophysical and structural data that will aid the Company is determining priority drill targets for an upcoming maiden drill program at the Dakouli 2 concession. "The compilation of exploration data is an important step for Dakouli," said president & CEO, Alex Klenman. "Although we're anxious to drill test several areas, particularly those that have produced visible gold, a methodical approach to prioritizing those drill targets will give us the best opportunity for exploration success," continued Mr. Klenman. 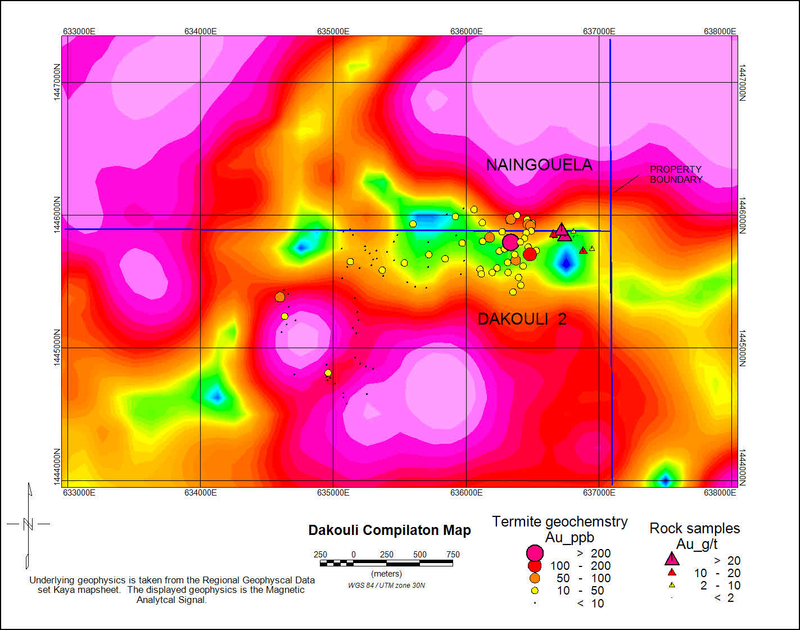 The Dakouli 2 exploration permit is located approximately 100 kilometers due north of the capital city Ouagadougou. The 98-square kilometer permit lies immediately south of the Company's Niangouela property which has been explored over the past two years. Drilling at Niangouela has returned significant intercepts, including 26.69 games-per-tonne ("g/t") gold ("Au") over 4.85m (including 1m of 132 g/t Au), and 4 g/t Au over 6m (including 20.5 g/t Au over 1m). In late 2018 the Company conducted an initial mapping/sampling program at Dakouli 2, collecting 25 samples at that time. 11 samples returned values greater than 1 g/t Au and five samples exhibited various concentrations of coarse, nuggety, visible gold, returning assay values greater than 11 g/t Au. All 25 samples taken to date at Dakouli 2 have tested positive, with several returning significant gold values (see Table 1). The Dakouli 2 property is located on the Goren Greenstone belt and is bordered to the north by granitic rocks. It is also bisected by the Sabce Shear, a major structural fault zone proximal to multiple gold deposits, which trends southwest northeast and bisects the entire long axis of the property. The Company is also pleased to announce that it has closed a second tranche of its non-brokered private placement. In connection with closing of the second tranche, the Company has issued 3,492,565 non-flow-through units (each, a "NFT Unit") at a price of $0.115 per NFT Unit, and 1,431,999 flow-through units (each, a "FT unit") at a price of $0.15 per FT Unit, for gross proceeds of $616,444. When combined with the proceeds from the first tranche of the placement, the Company has received gross proceeds of $1,737,109. The Company intends to complete a further tranche of the placement, which may consist of both NFT Units and FT Units and will provide additional information on this final tranche as soon as it becomes available. Each "NFT Unit" consists of one common share of the Company, and one common share purchase warrant (each, a "NFT Warrant"). Each "NFT Warrant" entitles the holder to acquire an additional common share at a price of $0.18 for a period of twenty-four months. Each "FT Unit" consists of one flow-through common share of the Company, and one common share purchase warrant (each, a "FT Warrant"). Each "FT Warrant" entitles the holder to acquire an additional common share at a price of $0.20 for a period of twenty-four months. Flow-through funds will be used in upcoming exploration activities at the New Pilot Gold Project in BC, and the McKenzie Gold Project, in Red Lake, Ontario. In connection with completion of the second tranche of the placement, the Company has paid finders' fees of $43,541, and has issued 191,840 NFT Warrants and 143,200 FT Warrants, to certain parties who assisted the Company by introducing subscribers to the placement. The Company may pay additional finders' fees on subsequent tranches of the placement. All securities issued in connection with the closing of the second tranche of the placement, and any subsequent tranches, are subject to a four-month-and-one-day statutory hold period in accordance with applicable securities laws. Completion of any subsequent tranches of the placement remain subject to the approval of the TSX Venture Exchange. Nexus Gold is a Vancouver-based gold exploration and development company with active projects in West Africa, and in Canada. 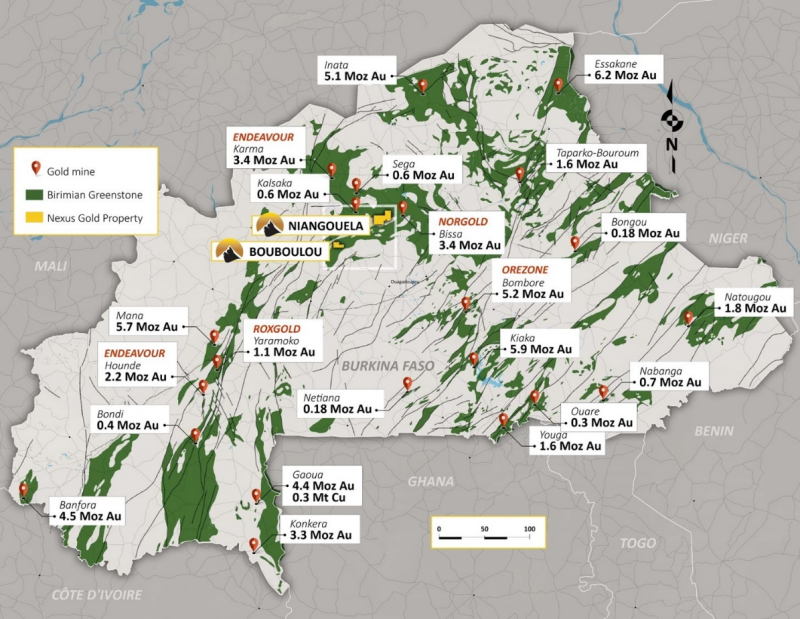 The company is currently concentrating its efforts on establishing a compliant resource at one or more of it's four current Burkina Faso-based projects which total over 560-sq kms (56,000+ hectares) of land located on active gold belts and proven mineralized trends. For more information please visit www.nexusgoldcorp.com.